Davide Frattini in the starting grid. 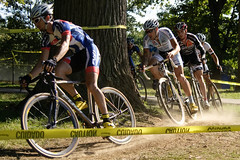 Team Fuji’s Davide Frattini came to Charm City Cyclocross with arguably the best form in the elite men’s field. He proved this the day before by winning Nittany Lion Cross, race #1 in the MAC Cyclocross series. At Sunday’s Charm City Cyclocross, Frattini, who rides on the road for Colavita/Sutter Home, survived a mid-race crash to rejoin the lead pack and ultimately pull away at the end for the victory. Frattini previously won Charm City in 2007. Davide travelled from Baltimore back to his home in Italy but was kind enough to take time out of his travels to answer some questions. Pay special attention to his pre-race routine. You don’t have to copy it exactly but it shows the meticulous planning professional racers undergo. It’s not just being a better athlete, boys and girls, it’s doing the little things that put yourself in the best position to win. What was your favorite part of the course? Davide pilots the group to the small climb. Frattini: I think the small climb leading up to the pit and the section near the pit before the soccer field. I liked the first left turn after the finish because was a fast one… but since I crashed I think next year I will take it a little bit different and probably slower ahahahah! What was the decisive moment in your race? The point in which the race was either won or lost. Can you describe it for us? Frattini: When I crashed I was really worried, I think that was a decisive moment. I lost a lot of time straightening my handlebar and I got lucky that my right front cantilever was just bent but not broken. I try to not panic and I find a lot of small groups without big gaps between, mentally I was good. What is your pre-race routine and what did you eat beforehand? Frattini: I usually try to have a good breakfast with coffee (from my espresso machine…the best!) with milk and cereal. Three hours and thirty minutes from the start I eat a good plate of pasta or oatmeal. I try to ride the course 2/3 hours before. The first laps give me an idea on tires and pressure to use and critical points. Laps 2,3 and 4 I try to find the safer, faster and easier lines to pick in the technical sections. Usually I manually lower the pressure. Just feel the pressure with my thumbs. I need to feel the bike riding fast but comfortable. Then I ride on the road or on the trainer if it’s raining. With one hour to go one energy gel. Basically, fast sugar. Then pin my number and on the road again with a few 15 second jumps and an easy loop after the women finish just to check if my lines are clear and re-check the tires pressure. What is one piece of advice you would give to somebody just starting to race cyclocross? Frattini on the front, near the crash site. Frattini: If you are coming from the road, just think about a criterium on the grass. Don’t look at the results, but just have fun and try to see where you are at. Try to give yourself an idea of what kind of course you like the best… Muddy, dry, flat, technical. Where you feel strong and where you are weak. From there you can start to define your strength sections and work to improve your weakness. What wheels and tires did you run? Clinchers? Tubulars? Tire pressure? Frattini: This year Mavic is my wheels sponsor. three tubulars, one clincher. I’m in Italy right now, Gommitalia tires just gave me few new tires to try. I will race with the well know Tubular Gommitalia Magnum cross 32 mm and a brand new Tubular Magnum cross Performance 32 mm ( few grams lighter and with a black sidewall). Also I will test a Gommitalia Prototype Clincher 32mm. Tire pressure depends on the terrain, course and weather condition. I usually ride very low ,3.0 [bar] and below, I am pretty light. [Ed. note: 3.0 bar is 43 psi.] In the mud I like to feel the touch of the rims. 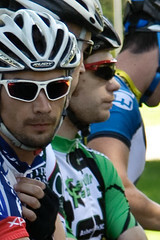 The lowest tire pressure I touch I think was 2.5 [36 psi] front and 2.8 [41 psi] rear in a World Cup race in Belgium. Any funny or memorable moments during your race? Before? After? Frattini: I’d like to say that was really nice to see races like Charm City and Nittany Lion growing to a UCI status. Impressive in only few years. Cyclocross in the States became very popular and that is because the promoters put together very well organized races with amazing courses. Fans and riders love that! Give a shout out to somebody. Frattini: To my friend Marzio Marzorati from Gommitalia/Ambrosio who died a few weeks ago from Cancer. To my sponsors for the 2009/2010 cross season Fuji, Mavic, SMP, Rotor Rings and Gommitalia. 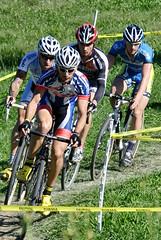 By the way, you can also see Jamey Driscoll and Christopher Jones, the main animators of the 2009 Cross Vegas race, in action here.